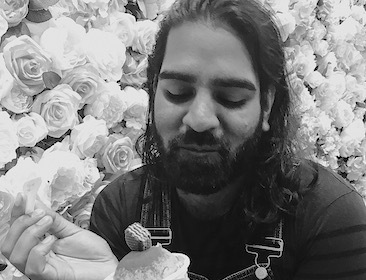 prakash is a burgeoning academic in the field of communication studies, seeking to conduct research at the intersection of queer, feminist, and critical race theories. After working in nuclear waste disposal, prakash sharply pivoted into the media sphere via major motion picture production. Witnessing the absence of diverse voices within mainstream media, prakash aims to investigate and highlight non-normative community media production, publishing, and distribution. Particularly, ways in which multiply-marginalized communities (namely QTBIPOC artists/activists) utilize alternative print and digital media as sites of identity archiving, grassroots organizing, and community building against the backdrop of white supremacist, patriarchal, and colonial societies.